"Our Mission is to provide physically and mentally stimulating inclusive classes open to all, which enhance and enrich the lives of individuals with special needs in a fun filled environment." Engage and inspire individuals to actively participate. Adapted to fit the needs of special populations making them fun and accessible to all. Encourage self-expression and individuality, to enhance self-esteem. Teach the concepts of team work and trust, to instill confidence in social interaction. Stimulate mind and body to initiate positive change and progression toward individualized goals. RSC worked with Special Citizens Futures Unlimited on this years Miracle League BBQ performance. Thank you to all the staff at the Miracle League and at SCFU for making this possible. Is your group interested inclusive Performance Projects? please get in touch. Day trip to watch the Red Bulls.. 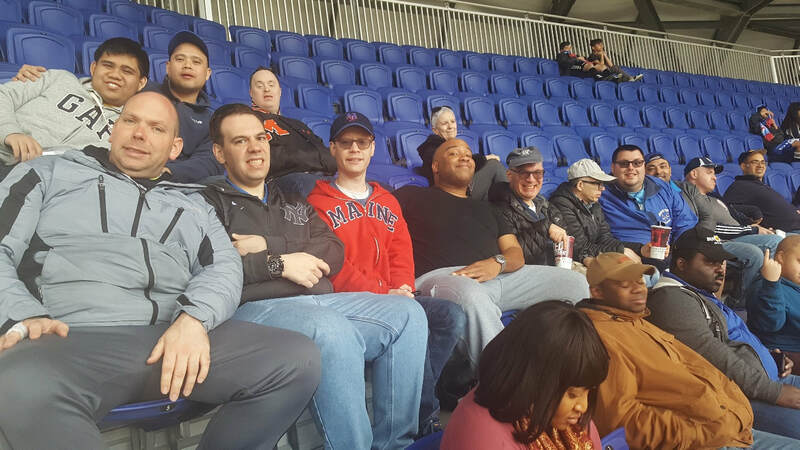 Celebrating the start of our Spring Saturday Soccer games some of the participants went to watch the NY Red Bulls play against the Chicago Fire on April 21st at Red Bull Arena. This game was in coordination with Autism Awareness month. Registration is open to sign up for RSC Westchesters' Spring Soccer Clinic. Ballsport moves to House of Sports in Ardsley. 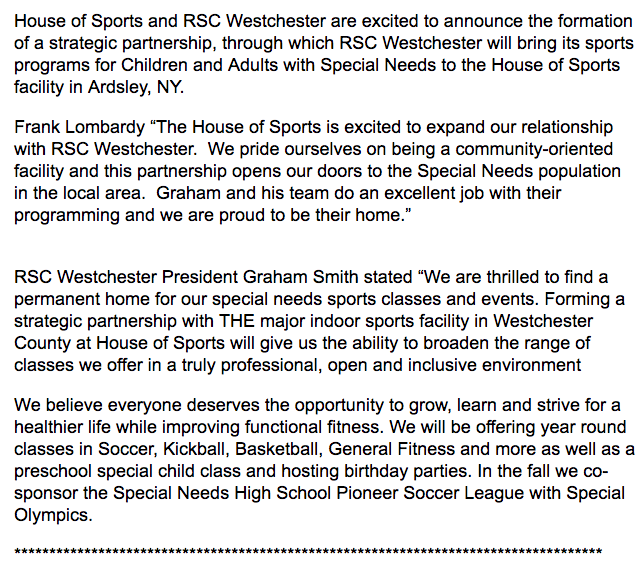 RSC Westchester is excited to anounce Ballsports programs will be moving to the state of the art facility ' House of Sports' in Ardsley, NY from January 2018. The center is Wheel chair accessible and suitable for those with mobility issues. We have slots available for group to join the ballsports programs in 2018. Please get in touch with us. This Summer RSC Westchester worked with the amazing clients at Special Citizens Futures Unlimited. Choreographer Noel Rodriguez and dance teaching artist Aya Saotome worked with the group over 10 weeks creating a dance piece. The group performed to songs of Bruno Mars at the Miracle League Barbecue as well as a sharing for friends and family at SCFU onsite location in the Bronx. Thank you to all the Staff at SCFU. We are excited to working with group again in 2018. If you are interested in working with us for a Performance Project please get in touch.